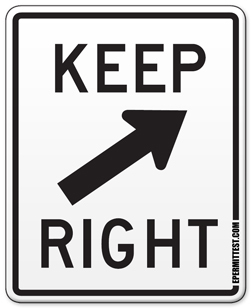 While the look of the "KEEP RIGHT" sign may change from state to state, its meaning is always the same. The sign marks a traffic island or a highway divider and it warns you to stay to the right of the obstacle. When this sign is installed at a highway, it may also be accompanied by the "DIVIDED HIGHWAY BEGINS" yellow warning sign.